My friend Ruben gave me the recipe that inspired this one. He made his with lean ground turkey and pan-steamed the meatballs. I thought it sounded delicious, but ground pork was on sale at my neighborhood’s Asian grocery store, and I decided that was more Chinese anyway, so that’s what I used. I added fresh chopped spinach, because I love the bright flavor and color it imparts to meatballs, plus it’s a healthy and cheap way to get more meatball for your buck. A heap of rice vinegar-soaked shredded carrots and cucumber gives this sandwich a kind of banh mi feel, and fluffy Chinese steamed buns provide just the right amount of structure for the juicy and flavorful sandwich fillings. Prepare each individual sandwich before serving or set out platers of the buns, meatballs, carrot-cucumber mixture, condiments and cilantro and let people assemble their own sandwiches. Note: Ruben teaches fourth grade at a low-income school in New York City. His classroom library desperately needs new books. If you can, please take a second to help him out. 2-3 tsp (depending on how spicy you like it) Asian chili sauce, plus more for serving $2 for 8 oz. 1 tbsp rice vinegar $2.50 for 12 oz. hoisin sauce $2 for 8 oz. In a mixing bowl, combine pork, garlic, ginger, soy sauce, black pepper, scallions, spinach leaves and egg. Use your (clean) hands to mix well. Form into golf ball-sized meatballs and arrange on the prepared baking sheet, making sure they are evenly spaced. Bake for 12-15 minutes, or until cooked through. While meatballs cook, combine the carrot and cucumber in a small bowl and drizzle with the vinegar. Toss to coat and set aside until ready to use. Steam the buns according to package directions (I find it easiest/quickest to microwave them for 1-2 minutes, wrapped in a damp paper towel). Split buns in half, lengthwise. Spread a little hoisin sauce on each half of the buns. 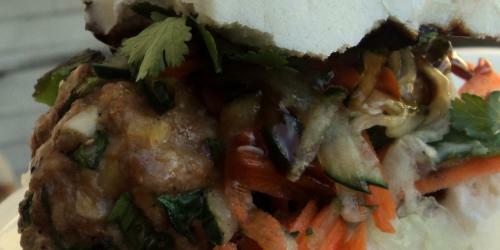 Place 1-2 meatballs, topped with the carrot-cucumber mixture and a sprig of cilantro on the bottom half of each bun. Top with the other half of the bun. Serve immediately, with extra chili sauce on the side. Makes 6 sandwiches (serves about 3). There are many platforms which has claimed for the real instagram followers for those let me tell you that try our tool which makes you believe in free instagram followers and real one so try to get it and make it easy . Nice post. I find out something new and difficult on personal blogs I stumbleupon day-to-day. It’s always interesting to study written content posted by writers and practice a little something of their sites. Good read. I learn something totally new and difficult on websites I stumbleupon day to day. It will always be useful to read simple things content material from the internet writers and practice a little of their websites. Nice post. I find out something new and difficult on sites I stumbleupon day to day. It will always be fascinating to read through articles from other editors and practice something of their online websites. Nice post. I learn something totally new and difficult on personal blogs I stumbleupon every day. It’s always interesting to study material from the other editors and use a little something from their web pages. Good read. I learn something totally new and challenging on sites I stumbleupon day to day. It will always be fascinating to read through information posted by internet writers and practice a little from other web-sites. Good read. I learn something totally new and challenging on sites I stumbleupon each day. It’s always interesting you just read material posted by author`s and use something from their websites. Nice post. I learn something new and difficult on articles I stumbleupon regular. It will always be interesting to learn content material from the other writers and use a little something from their online websites. Good post. I learn something new and difficult on sites I stumbleupon everyday. It will always be fascinating to learn content from the editors and practice something from their online websites.